Users of Wireshark 1.8.0 (or later) have most likely noticed that the default output file format has changed from libpcap (.pcap) to Pcap-NG (.pcapng). So what does this mean other than a longer file extension? Traffic captured from multiple interfaces can be stored in a single file. This even works when the interfaces have different data link types, such as Ethernet, 802.11 (WiFi) and PPP. PcapNG trace files can be tagged with metadata info about what OS, hardware and sniffer application that was used to capture the traffic. Wireshark and dumpcap automatically tags generated PcapNG files this way. There is a long list of metadata attributes that can be stored about each interface. This list includes attributes like interface name, dropped packets and used capture filter. Text comments can be added and saved to individual frames. These comments, which are called “annotations”, are available in Wireshark and Tshark via the display filter named “pkt_comment”. You might also have seen improved timestamp resolution as a new feature of the PcapNG format. It is true that the PcapNG format allows for more precise timestamps compared to the microsecond resolution provided by the old PCAP format. This does, however, not mean that you will get nanosecond resolution in your capture files just because you switch to the PcapNG format. The default timestamp resolution in PcapNG files is still microseconds, and tools like Wireshark and dumpcap additionally only get microsecond resolution timestamps from the library they rely on for packet capturing (i.e. libpcap or WinPcap). One way to convert such multi-encapsulation PcapNG files back to PCAP format is to first split the capture file into multiple PcapNG files, by using the display filters “frame.interface_id” or “frame.dlt”, and then convert each individual PcapNG file back to PCAP using editcap. Another option is to submit your PcapNG file to the conversion service provided at pcapng.com. This free service only lets you convert file sizes up to 1MB, but it's really easy to use and you don't need to sign up or register to use it. Just choose a file and press “Convert to PCAP”, the site will then provide you with PCAP formatted capture files for each interface. A customer recently contacted us because he wanted to load ERF capture files from their Endace probes into NetworkMiner Professional. In order to do so they would first need to convert the ERF file into the libpcap format. The obvious solution is to use editcap and specify the output capture type with “-F libpcap”. However, it turns out that by doing so the captured data in each frame will still be preceded by an ERF header. This causes a problem for tools that handle pcap files but do not have a parser for the ERF header format. Success! All ERF headers are now gone and the output pcap file contains plain old Ethernet frames. 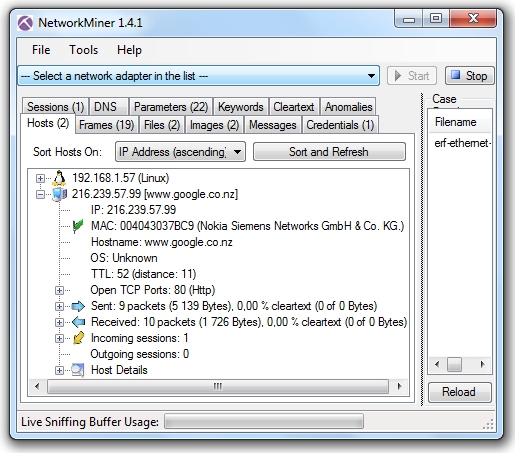 You can now open the pcap in NetworkMiner or whichever pcap parsing tool you wish. Another way to convert an ERF file to the PCAP or PcapNG format is to carve packets from the ERF file with CapLoader.